We closed our first tranche of EIS last summer, we have now closed the first tranche of our SEIS and commenced deployment. The next tranche of EIS and SEIS closes to investment on Wednesday 27th March 2019 to allow for deployment before the end of the tax year. 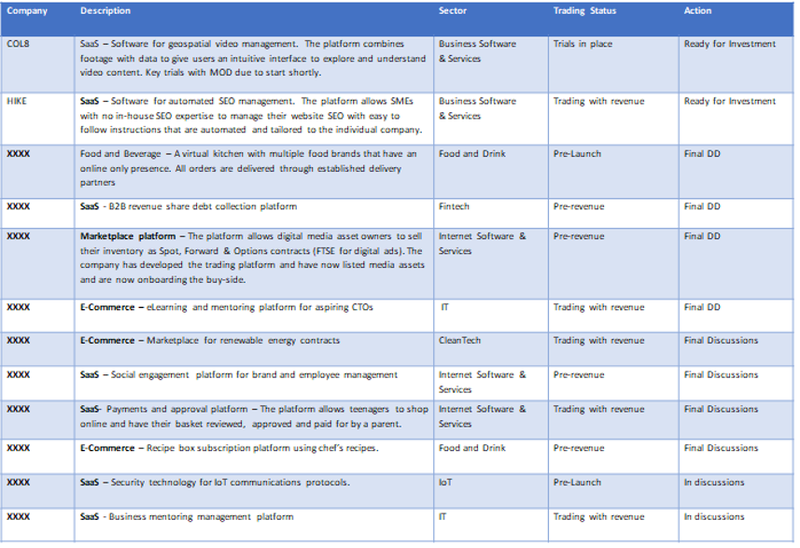 Here is a flavour of some of the interesting companies coming through our screening process that are investment ready. For confidentiality purposes we cannot give too much information on the companies we are reviewing. There is a ‘carry-back’ facility which allows all or part of the cost of shares acquired in one tax year to be treated as though the shares had been acquired in the preceding tax year. The SEIS rate for that earlier year is then applied to the shares, and relief given for the earlier year. This is subject to the overriding limit for relief each year. If you still have an allocation for the previous tax year we are lining up further investments ready to deploy over the coming months, so the tax reliefs available can be carried back one year to apply the tax reliefs in 2017/2018. For investors with an income tax liability and a capital gains liability, investors under SEIS have the opportunity to make a £100,000 investment at a cost of only £36,000, if using carry-back reliefs. Investing in our existing portfolio of companies via our EIS, combined with new innovative and disruptive technology firms via our SEIS. Ability to choose either EIS, SEIS or a blend of investments. Investments in up to 10 SEIS and 5 EIS entrepreneurial high growth companies, giving diversification. Target return of £1.85 per £1.00 invested over 5 to 7 years. Next close 27th March 2019.